Karma means cause and effect. The law of karma teaches us that everything we do and say and feel creates a result. That result is the life in which we find ourselves. 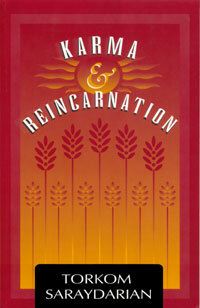 Reincarnation is the process through which the human soul enters into physical existence, or incarnation. We have been born thousands of times and will die and be born thousands more times. Each birth is an opportunity to grow the treasury of our human soul. Each death is an opportunity to experience the treasury of the Higher Worlds. How does karma work? Karma brings you into a life situation that presents an opportunity to learn a lesson, heal a wound, undo a wrong, or gives you the ability to make choices that help you grow spiritually into a more mature and wise person. "Karma is the Law of Cause and Effect. There is no effect without a cause; there is no child without a parent. Whatever you sow, you reap. This applies not only to that which we see around us, but it also applies to our emotions, thoughts, actions, and words. Whatever cause we create, we will receive effects. If there is an effect, there must be a cause; if there is a cause, there will be an effect." "For every action, there is an equal and opposite reaction in the physical, emotional, mental, and spiritual realms. How conscious are we going to be? What actions are we going to release and what reactions can we expect in return?" Our choices will face us again and again as we re-incarnate from one life to another. Humanity wonders why we live in a state of chaos, fear, global catastrophes, environmental pollutions, and such. We are living in our own creation! We will continue to suffer until we change the state of consciousness that creates the conditions of our life.